The 8th and 34th British Divisions objective was the town of La Boisselle. The 8th Division attacked from the north, up Mash valley between Ovillers and La Boisselle, while the 34th Division moved up Sausage valley and flanked La Boisselle from the south. Two large mines were set off to open a gap in the German defenses, but the mines, and the week long British bombardment preceding the attack, had little effect on the Germans. As soon as the bombardment lifted, the Germans returned to trenches and the British advance meet with disaster, as most of the land they were crossing provided little cover. Some of the German trenches were gained, but the town of La Boisselle was still under German control at the end of the day. The British forces gain 1 Temporary Victory Medal at the start of their turn, when one or more units occupy any German trench hex. Place a Victory Medal, with the British side faceup, on the trench to indicate it is controlled. 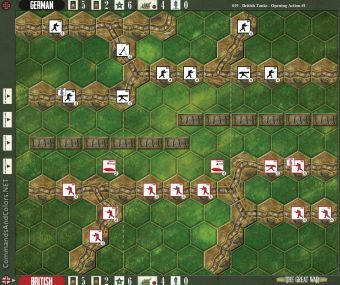 The British forces gain 1 Temporary Victory Medal at the start of their turn, for each building hex occupied. The mine crater hex is a Turn Start Temporary Medal Objective worth 1 Victory Medal for the side that occupies the hex. The buildings in La Boisselle are fortified. 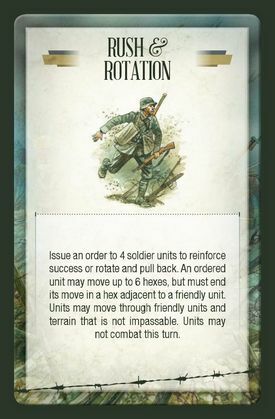 A unit on a fortified building hex will ignore 2 soldier symbols and 2 flags. Played some days ago with a friend of mine (I played Brit side). The initial No-Man's-Land helped a lot adding a lot of craters and providing defensive bonuses. Brits decided to advance on right side while Germans fired with reserve artillery and fortified their right side (city). British advance on left side ended in a disaster so British troops decided to suffer some flags to run back on their own trenches. British managed to kill 2 German units on center section. Germans decided a counteroffensive on mine crater with an additional british unit killed. 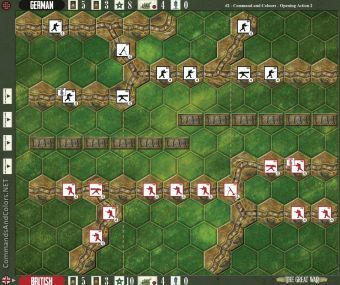 British decided to get maximum result using the breakthrough rule, so advanced with a single unit and played a "Rush & Rotation" card to let 4 units reach German baseline. During the next turns British let a couple units break through getting 2 + 2 VPs. I do believe that combining "Rush and Rotation" card with "Break Through" rules has been a great help. Adding the lack of German units... it has been unstoppable. Nice play, at least on British side. Will go to next scenario next. Good coverage on No-Man's-Land shelling is very important for the Brits in this scenario. interesting scenario, with no Wire, but considerable distances to cross on right flank.